Here' s something else I make from recycled sweaters. I usually start by making mittens, then some potholders. I've started covering journals in "sweaters", so that would come next. 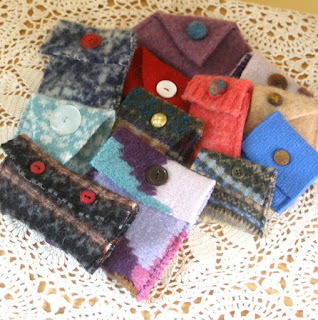 With the leftovers I make "treasure bags", little pockets with buttons that can be used for small gifts, or glasses, or MP3 players or whatever you can imagine. It's a lot of fun to see how much of a sweater I can put to good use...and I found someone who hooks rugs who may be able to use the scraps I can't use. Wow!